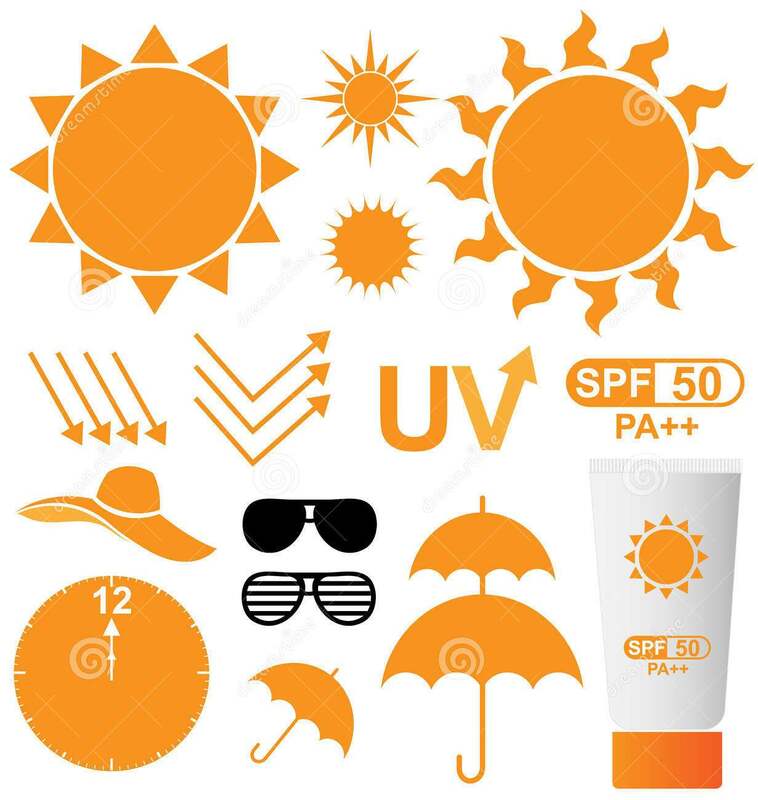 I purposely try to publish this discussion about sun protection today because it is the first day of Summer and protecting your skin from sun damage is very important, unless you want to get sunburn, prematured aging signs and skin cancer. This will be a long post but I hope it will be beneficial to you all. 1. What is sun protection? 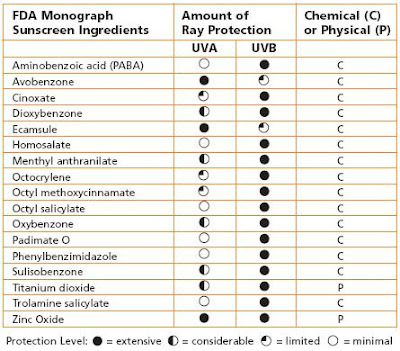 Sun protection is not about avoiding the sun completely. Our skin needs to be exposed to the sun in a short period of time each day to generate vitamin D. "When the sun's UV-B rays hit the skin, a reaction takes place that enables skin cells to manufacture vitamin D. If you're fair skinned, experts say going outside for 10 minutes in the midday sun—in shorts and a tank top with no sunscreen—will give you enough radiation to produce about 10,000 international units of the vitamin. Dark-skinned individuals and the elderly also produce less vitamin D ... The sunshine vitamin may protect against a host of diseases, including osteoporosis, heart disease, and cancers of the breast, prostate, and colon. What's more, sunlight has other hidden benefits—like protecting against depression, insomnia, and an overactive immune system." (Source: health.usnews.com). However, the UV rays from the sun are harmful if the skin is exposed to them for a longer time. 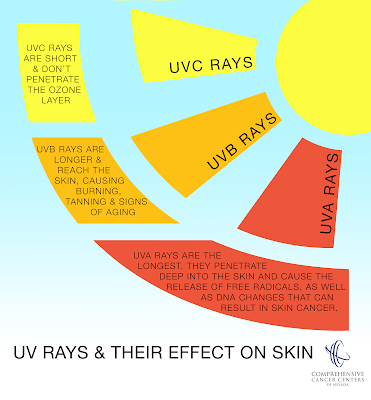 In short, UVB rays cause sunburn and signs of aging and UVA rays cause development of skin cancer. 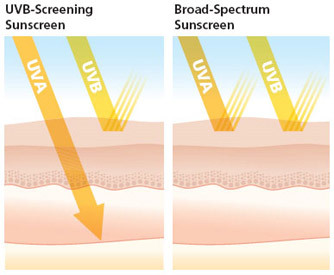 One way to protect your skin from getting harmed by the sun's radiation is to apply sunscreens/sunblocks when outdoor activities for more then 20 minutes is expected. 2. 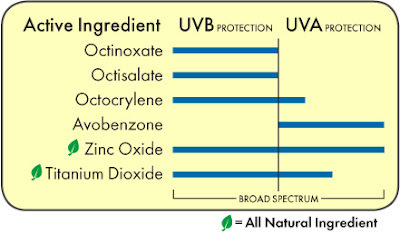 How do sunscreens/sunblocks protect the skin from UVA/UVB rays? 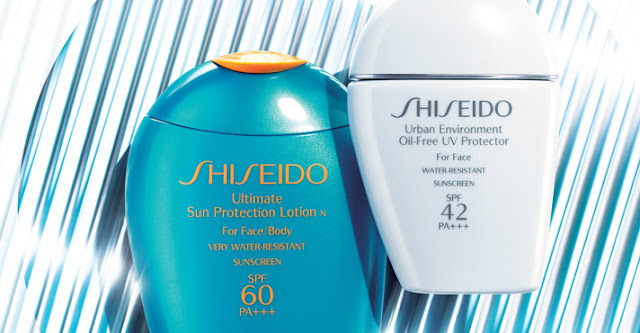 When buying products promising to provide sun protection, look for two things on the packaging: (1) broad spectrum and (2) sun-protection factor or SPF. Broad spectrum protects against both UVA and UVB rays while SPF protects against only UVB rays. 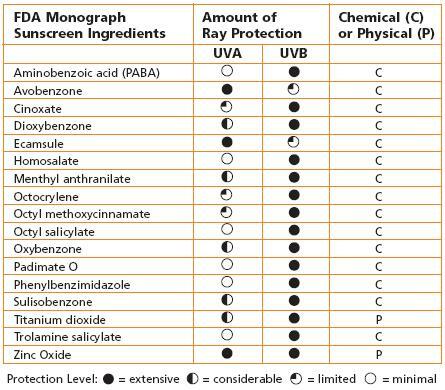 The SPF numbers indicate the time that product can protect you from the UVB rays. For example, SPF 15 means 150 minutes of UVB protection. However, you also need to take into account the fact that the lighter the skin tone is, the more easily the skin gets sunburn. 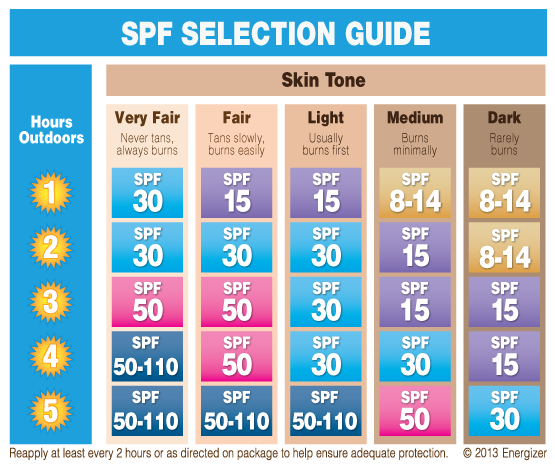 Also, while SPF >30 might be better, that doesn't mean you don't need to reapply your sunscreen every 2 hours of continuous sun exposure because the sun "eats up" the active ingredients through time and sweating and swimming cause the sunscreen to wear off faster. - "When sunlight hits the skin, chemical absorbers absorb the active UV rays and release their energy in harmless ways. 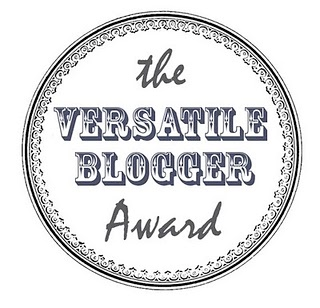 When UV rays hit skin coated in physical blockers, they are reflected and cannot penetrate the skin." (Source: wsj.com). - Chemical absorbers need to be applied 20 minutes before sun exposure and re-applied every 2 hours to be effective. Physical blockers work immediately and require no re-application, unless being "washed away" by water or sweat. - Physical blockers are thick and opaque so sunscreens containing them usually leave a white cast. Chemical absorbers are runny. - Chemical absorbers are easier to find than physical blockers. So far I've found only a few sunscreens that have a certain % of physical blocker. One example is the Sun Bum Clear Zinc Oxide. I'll do a review of this product later. 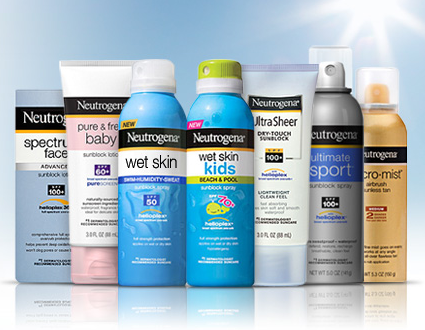 If you've seen my most recent post about my current skincare routine, you would know that my current favorite facial sunscreen is the Neutrogena Ultra Sheer Liquid Sunscreen which is an entirely chemical sunscreen. I use it under makeup everyday because I know I won't need to reapply due to the limited time I stay outdoor. I also used and like their body sunscreen and actually used it all up last summer, so I'm sharing the Banana Boat for Men Tripple Defense SPF 50+ with my husband. 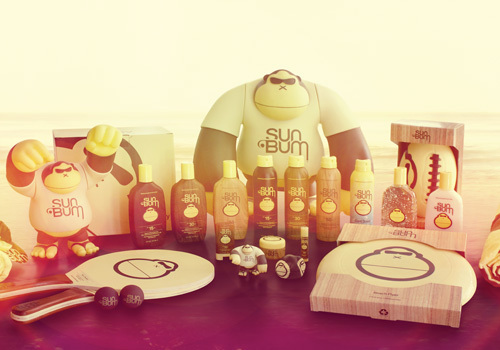 I recently bought the Sun Bum Clear Zinc Oxide for outdoor activities this summer. I came across the article "8 Sunscreen Mistakes You're Probably Making" on huffingtonpost.com and thought that it'll be extra helpful to share it with you. Click HERE to view. * Disclaimer: The photos used in this post are from different sources and are not owned or created by me.